Laws Governing When a Child Can Ride Their Bike? Two years ago, 13 year old Brien Alvezios was killed riding his bike along Branan Field Road in Clay County. The driver fled the scene. This is still a topic we have to think about. Per usual, comments on the Times-Union Article point at the cyclist as the fault. Despite the article providing little to no information other than location, time of incident, and that the driver fled the scene (no details at all are given about the young cyclist other than his age and condition), there is a fair amount of questioning as to why a teenager is out riding his bike at night. But one comment left on the Bike Jax Facebook has haunted me since I read it. The comment that sent shivers down my spine was, “Maybe they’ll charge his parents.” I instantly recalled articles from earlier this year where parents were threatened with removal by Child Protective Services for allowing their child to ride a bike to school. Or the Atlanta mother charged with Vehicular Homicide when her child was struck and killed while they attempted to cross a 4 lane highway without crosswalks. Yes, lets put the blame on the parents for inadequately designed roads. Since we don’t have completed details and all the information, we are left to assumptions. So let’s assume this young cyclist did everything correctly. 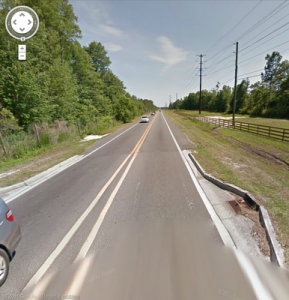 He was wearing a helmet (required by FL law for those under 16), was wearing light colored clothing ( not required by FL law for any age), had both front & rear lights, was controlling the lane since the lane is of substandard width as pictured below. I have yet to find any law or statute governing what time of day or night a parent can or cannot allow a child to ride his/her bike. Assuming that this young man did everything correctly given the situation, who is at fault? The driver who fled the scene most certainly is. But are they alone in blame? The parents for allowing their child to ride a bike at night? The child himself?….Maybe we should look deeper into who’s really at fault. First and foremost in my mind is FDOT. They designed and maintain the road. Utility poles are usually a very good indicator right-of-ways. Notice the amount of room on the right side of this road for any type of infrastructure in the way bike lanes, multi-use path, or even sidewalk that may have prevented this tragedy. But I’m willing to bet that extra space is being reserved for additional travel lanes. Because it’s far more important to move cars than people. Second is the County itself for allowing this road to built in the manor it is, without regard to pedestrians or cyclists. But, are these agencies really to blame? Perhaps if city, county and state governments hands weren’t tied by something that within the road planning and design groups is known simply as, “The Manual.” To the laymen it’s the The MUTCD or the Manual on Uniform Traffic Control Devices. This manual dictates every part of your driving habits and experience on every road you travel on. There is almost nothing contained in it that cover bicycle infrastructure and the safety of cyclist or pedestrians. This manual is completely about the movement of the automobile. Maybe the blame should be laid on the purveyors of this Manual. Maybe the blame should be spread around? Maybe a little goes to Club Riders, vehicular cyclists and the Florida Bicycle Association. Club riders and vehicular cyclists for fighting any type of cycling infrastructure that will take them off the road and keeping children them. FBA for not doing enough to promote cycling as transportation and it’s continued support of bicycles as recreation and toys along with the promotion of the culture of fear. Maybe the the blame goes even deeper, maybe we should take a look at the colleges and universities that teach our planners, designers and engineers to be manual reading zombies who are incapable of thinking outside of the box. I do know one thing for sure, the family of Brien Alvezios have suffered a great loss as has all the friends and families of everyone who has lost someone to bad or inattentive drivers or lacking road design. And it will continue to happen until cities, counties and state governments wake the hell up and design infrastructure to move people and not cars. I’m aware that I am opening a can of worms with some of my statements above. But I do so in the hopes of creating a dialog. Let’s talk about it, who is or isn’t at fault for this and all other tragic losses of life while using our roadways? Who’s to blame for the current state of bicycling culture and the total lack of infrastructure for both cyclists and pedestrians? How young is too young ride a bike alone on our streets?